Bridge of Weir is an affluent commuter village of around 5,000 residents located 17 miles to the west of Glasgow city centre. Many years ago – when the village supported no fewer than three leather tanneries – there were five golf courses in the local area. 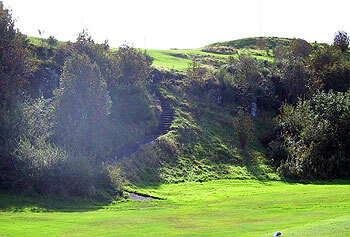 These days, only two courses remain – Ranfurly Castle and Old Ranfurly – and they are both very fine, 18-hole, moorland layouts, situated close to each other on the south west side of the village with commanding views of the Clyde Valley to the north. Old Ranfurly measures a shade over 6,000 yards, with a par of 70. Two of the three par fives on the card are played on the front nine – the 504-yard 4th hole, called “Harelaw” and the 500-yard 6th hole, named “Carselaverock” – which goes some way to explaining why the outward half is more than 500 yards longer than the back nine. Many members consider the best of the five par three holes to be the 172-yard, redesigned 5th hole, titled “The Covert” where the tree-framed green is well bunkered with a burn on the right to punish shots pushed in that direction. The 199-yard, par three 16th is a contender for the best hole on the inward half as it has all the potential, late in the round, to ruin a good score. This hole is a real tough cookie as it is played blind and uphill from the tee. [Full disclosure - I was a member here as a teenager, many moons ago] I've belonged to a few clubs over the years as I moved around the world. I've played at even more and volunteered at a few top R&A and USGA events on very select courses. It had been a few years since I'd played Old Ranfurly and during 2009, I returned to visit it once more during a vacation in the UK. Not much had changed since my youth, other than the area around the fifth green. I played on a bright, fall day when the sun was out, the skies were mostly blue and there was a slight, variable breeze that never quite seemed to be directly from behind me. The so-called 'monster' opening hole wasn't quite the monster I remembered it to be, playing no more than a drive and an eight iron to a really tiny, half-concealed green. Then I remembered all the blind holes. #1, #2, #3, #4, #9, #10, #14, #15, #16, #18. More, if you put your drive in the wrong spot. And that's when it struck me - to play this course, as any other quality course, you NEED to PLACE your drives. And this was the first time I had visited OCRGC with the ability to truly place my drives. And it was a delight! It's not a course you can play just once and enjoy. In fact, I would argue you may hate it first time you play it (a bit like Bob Jones at St Andrews). But it GROWS on you. By the time a semi-skilled amateur plays it for his third or fourth time, he starts to appreciate it, the importance of approaching greens from the right areas, the nuances of the kicks you can expect around the greens, the bunkers to avoid (almost all of them, as the sand was terrible quality). The layout is, admittedly, quirky. But is it any worse than the double greens of the 'other' Old Course? Is it any stranger than many of Scotland's other courses with a few blind holes? Compared to the vast majority of courses I have played in America, I would rate Old Ranfurly significantly better. And the course I would most favorably compare it to? Merion before it was revamped for last year's US Open. Old Ranfurly is a relatively inexpensive gem to play, although by the time you've played your five or more rounds to really appreciate it, you've still spent a small fortune! A very nice, well-kept 'secret' in Scotland's golfing world. It was all going so well at Ranfurly, up until the last four holes, that is. I’d really enjoyed my round on a course where the 440-yard 1st is a beast of a starter into the prevailing wind, the heavily-bunkered downhill par three 5th is a really fabulous short hole and the 14th, with its green perched on top of a crag, is a terrific par four. Why did the club, when it obviously acquired land in times gone past for holes 4 to 13, not find space to fit in at least another hole on this parcel, allowing the ground close to the clubhouse to be used more sensibly? As it stands now, the 15th is routed to a blind, sunken green, the 16th plays 199 yards -- blind and uphill -- to a green stuck on top of an escarpment, the 17th (a fine short par four in its own right, mind you) crosses the 1st fairway at almost a right angle before a wee par three is squeezed in at the end -- such a disappointing end to the round. Now I love quirk (Shiskine, Cruden Bay and Machrie and all favourites) but the ending for me here was just too wacky for comfort. A real shame as the first fourteen holes at Old Ranfurly are laid out on such good, solid golfing ground. Played here on a glorious sunny August afternoon, I wasn't sure what to expect - based on the mixed reviews below - I found it to be a friendly, welcoming track in good condition with fast greens. There were lots of green keepers out and about and everything was well looked after and in good condition. Our two ball was waved through by a kindly group of 4 senior members on the 4th, and they gave us good advice on the line to take which we nearly followed! There are massive elevation changes - especially on holes 15 & 16 (the blind par 3 SI-6). It's fair to say they could do with a little more room to spread the last four holes out over, your drive on the 17th passes over the 1st fairway, so care is needed, but as the tee box is 50 feet above the 1st, so we didn't have a problem. A fun course to play, not overly long, but I enjoyed the variety of the holes - not as posh as Kilmacolm up the road - but not bad for £30, I'd play it again. Mmm piece of ground with holes wedged in wherever possible. Didn't see what some others do at this course. As Shakespear said 'Much a do about nothing' Blind holes, fairways average course layout poor. Ok to play but not to pay. Sometimes unfairly called “Blind” Ranfurly, this superbly presented moorland course is a delight to all. Agreed, there are many par four/fives where the flag is not visible from the tee. It is however, clearly seen from every regular approach area on every hole bar the infamous par 3,16th.A fair course with demanding par 4’s. The perfect example of these is the 14th where both drive and 3 wood or wedge approach, depending on the wind, require pinpoint accuracy or you will simply not find the plateau of the fast, lush rolling green. This and the closing 4 holes, are fraught with danger. A steady hand and strong power of mind are required to take you home.A friendly clubhouse awaits with excellent fayre at good prices.Don’t hesitate to visit, I do - every week !